You certainly know you’re in New Zealand when you’re doing a road trip in the North Island of New Zealand with its many Maori place names. I can get my tongue around most of them but as we drove through places like Maungatautari, Putaruru, Kihikihi, Otaparau, Kuaotunu, Pukemoremore etc – I was still trying to work out the pronunciation of many long after we’d passed through the town – although we are talking fairly small towns many of which you pass in a blink of an eye. We do an annual road-trip in the top half of the North Island each year to visit some loyal customers and of course to find some new ones. On this trip we also hosted two wine dinners in towns we haven’t done events in previously. After arriving into Auckland and getting our rental car we drove down to Hamilton, our first stop on this tour. 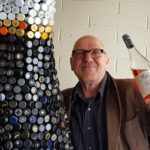 Visiting Henry at wine shop Primo Vino is always a lot of fun and he was in fine form, and we also met with Chris and the team at Hamilton Beer & Wine company who have stocked our range of wines for many years as well as servicing many of the local restaurants. On this trip we also went to a new venue called Mr Pickles to see Mat and Maurice who have an awesome spot overlooking the Waikato River. This is sure to be a very popular wine over the summer so we’re delighted to now have our wines listed there. We also called in to see the lovely Kim at Chim Choo Ree – a very creative dining space which reflects Kim’s quirky and eclectic sense of style. 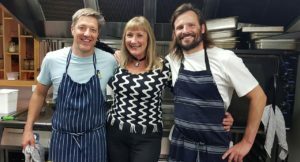 Then we were off to Rotorua to get ready for our first wine event at Terrace Kitchen where Chef Timo had been preparing the most amazing degustation menu. Terrace Kitchen has built a great reputation for their food and their service – and now that we’ve experienced it, we understand why they’ve earned it. Welcoming nearly 50 guests in the upstairs area of the restaurant, we started with a glass of Limelight Riesling with some canapes. Moving downstairs, the degustation menu got underway with course after course of delicious food which was presented with amazing skill and flair. 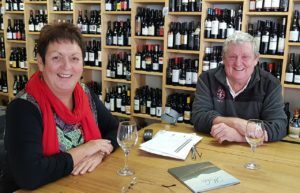 We were off the next morning to Te Awamutu to see Matt, one of the owners at Farenheit, an à la carte restaurant who regularly list our wines. 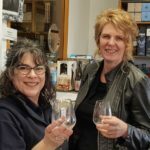 We then continued on to Cambridge and did tastings with two wines shops and two restaurants, including an exciting new restaurant called St Kilda Bistro where Katie and Dave, the passionate new owners, are redefining menus and wine lists. After a long day of account calls we drove to Thames and checked into another motel and enjoyed our evening off. Our third day was to be a day of twists and turns – literally! Starting from Thames at the southwestern end of the Coromandel Peninsula, our day was spent weaving in and out of towns up and down the peninsula. I did make the mistake of looking at my phone for a short time during the first part of the day, which then made the second half of the day not so pleasant as I ended up with motion sickness. The bends in the road are relentless and it wasn’t until late in afternoon when we finally arrived in Whangamata where we were due to host a wine dinner, that I had a chance to recover! Our day on the Coromandel just had to include a visit to Puku and Kerre’s in Matarangi – great supporters of our wines. We can’t believe how a wine shop in a town of just 300 manages to drink that much wine! (The town does swell to more 7,000 over summer though). 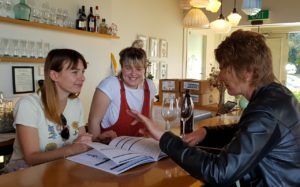 We also dropped in to see Severine and Sam at Poivre & Sel, the lovely French fine dining restaurant in Whitianga and the perfectly positioned Salt Restaurant where AJ enjoyed tasting the latest vintages with his perfect view over the marina. Our second dinner of the trip was in Whangamata – which has a beach voted ‘Best Beach in New Zealand 2018’. Whangamata attracts people not only for its great surfing breaks but also the many outdoor activities including walks and bike trails in the beautiful rainforest. It hasn’t been known as a town for great dining but the Port Road Project has changed that! Jason, Emily and Barend were lured by the attractions of the beach town from the Waikato to set up a restaurant. Chef Jason was the founder-owner of Hamilton’s top-rated Scotts Epicurean but he closed the doors of that in 2016 and by the end of the year the new venture opened. Primarily a day time eatery it does open on Friday and Saturday evenings although it opened on a Thursday for our special wine dinner. Filled with some 31 locals, our wine dinner was a great success. Andy and I were responsible for not only talking about the wines and telling stories during the dinner, but we also had ‘real jobs’ and poured all the wines during the evening whilst the team focussed on serving up some delicious ‘honest’ food that they describe as ‘the sort of food we like to eat’! Port Road Project has certainly been a hit with one man telling me he couldn’t live without them and that he was there every morning … but asked me not tell his wife! Our final day was a very hectic one in Tauranga and ‘the Mount’ – ie Mount Maunganui. We had to leave Whangamata at 6.30am to get to Tauranga in time for our first meeting/tasting at 8.30 in the morning! 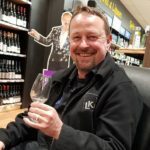 We visited various wine retail stores including our great mate Pete Croad at Liquor King at the Mount, who continue to stock our wines and be very enthusiastic supporters. Also Sue at Super Liquor in Greerton carry a range of our wines and is always one of the most enthusiastic tasters! Although it was a busy day, we did manage a quick lunch at the Test Kitchen restaurant where I indulged in a wonderful Duck Confit (something I must have if I see it on a menu) matched with a glass of bubbles – well it was a Friday after all! Clarence Test Kitchen has been set up in preparation for a new project – Clarence. Located in one of Tauranga’s oldest buildings – the Post Office, the conversion to a boutique hotel and restaurant is currently nearly completion. 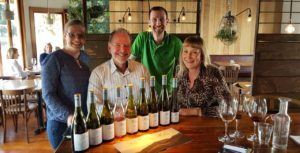 Richard Burton will be the Food & Beverage Manager, so it was great to see Richard at the Test Kitchen to give him an opportunity to taste our new vintages! As the ex-sommelier from Huka Lodge, New Zealand’s most iconic luxury lodge, Richard’s wine list will reflect the best of New Zealand wines as well as having an extensive international selection. We can’t wait for the opening! After visits to The Barrel Room and the lovely Postbank restaurant, we were finished with day’s sales calls and tastings. Exhausted we opted for a recommendation by Pete Croad and had a lovely Italian meal at Mamma Mia’s then went back to our motel for a very early night. 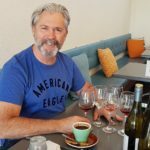 The next day, just before our three hour drive back to Auckland airport for our flight home, we stopped in at Tay Street Beach Café to catch up with owner Hamish for a final tasting. Being a block down from where Andy grew up and overlooking the beach at Mount Maunganui, it was a perfect spot for breakfast and reminiscing! 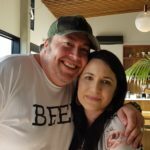 Our time in the North Island consisted of 1200 kilometres by car (with hundreds of bends and curves), 4 motels in 4 days, 90 people at 2 wine dinners, loads of tastings and even more laughs! Thanks to Sonja at Negociants New Zealand who put our schedule together and spent a couple of the days with us. Getting out to see customers (as well as supporting our distributor’s effort) is what it’s all about. Living the dream? We certainly are!